President-elect Donald Trump has said UKIP leader Nigel Farage would make a good British ambassador to the US. Mr Trump said "many people" would like to see Mr Farage as ambassador and he would do a "great job". Mr Farage, who helped Mr Trump during his US presidential election campaign, said the suggestion had come as a "bolt from the blue", adding: "If I could help the UK in any way I would". But No 10 rejected the suggestion, saying "there is no vacancy". Mr Trump tweeted: "Many people would like to see @Nigel_Farage represent Great Britain as their Ambassador to the United States. He would do a great job!" Mr Farage, who is UKIP's interim leader, was the first British politician to meet him after his victory, and said there was a "real opportunity" for improved UK trade with the US. He also spoke in support of Mr Trump at election rallies in the US during the campaign. He said: "It's all a bit of a shock to me. No one had mentioned the idea to me but I have good relations with his team and if I could help the UK in any way I would." 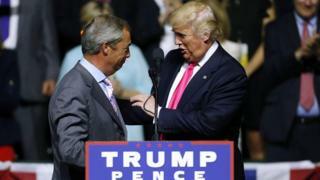 Mr Trump was "a serious anglophile and a friend of this country", Mr Farage added. By any measure this is an extraordinary intervention. The future head of state of one nation telling another country who they should appoint as their ambassador is unusual enough; when it is two nations that are meant to share a special relationship it is a breach of nearly every rule of diplomatic protocol. At a stroke it puts tension into the Trump/Theresa May relationship before they have even met. The prime-minister's office can say no more than it has full confidence in the current ambassador. It also leaves the current holder of the post, Sir Kim Darroch, in an awkward position as he seeks to forge closer contacts with the new administration. His position has been undermined by the future president. In Downing Street and diplomatic circles there is consternation. But for Nigel Farage - who has always delighted in tweaking the tail of the Conservative Party - there will be amusement, and it seems in the future leader of the most powerful nation on earth he has a willing partner. Since Mr Trump's election there has been an anticipation that the rulebook might not be followed. Few anticipated this though. The president-elect's meeting with Mr Farage was seen by some as a snub to UK Prime Minister Theresa May, who will not meet Mr Trump until early next year. Mr Trump has spoken to Mrs May by phone and there have been other contacts between British ministers and representatives of the incoming administration. Asked about Mr Trump's tweet, Brexit Secretary David Davis said: "People can say what they like but the simple truth is there's no vacancy. the ambassador there is very very good, as we've seen. "We believe in free speech - we have a very good ambassador in Washington, Kim Darroch, and he'll be there for years." And a Downing Street spokesman said: "There is no vacancy. We have an excellent ambassador to the US." BBC assistant political editor Norman Smith said he understood that Downing Street was adamant there would be no role for Mr Farage. Liberal Democrat leader Tim Farron tweeted that the suggestion of Mr Farage as UK ambassador to the US was a "frankly stupid idea". He added: "I have more diplomacy in my little finger. But what's more worrying is the axing of TPP." Mr Farron was referring to Mr Trump's announcement that he would quit the Trans-Pacific Partnership trade deal on his first day in office.